Sportszone Group are proud to announce that they secured two entries in S2- Construction of Sports Courts (Domestic >$100k). 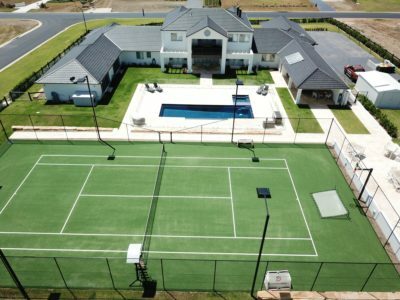 The project comprised of the design and construction of one 16.5m x 33.5m North to South aspect Acrylic Hard Tennis court. The site required excavation and supply and installation of a concrete slab, reinforced with SL 72 mesh, 3 Coats of synpave ( Rebound Ace) with line markings for tennis and one set of net posts and one tennis net. With MPC Fencing installing a 3m black powder coated chain mesh fence with top rail design. Before the commencement of work the site for the proposed tennis court was beside the new under-construction residence with temporary fencing and construction materials, with workers using the area as a storage platform. The area has a drainage easement that needed to stay untouched and existing full trees, and old stumps were scattered in the construction area. As with many projects we work on there are special considerations and challenges that need to be addressed, and this project was no different. The placement of the court was crucial as not to disturb the drainage easement and to look aesthetically pleasing with the new residence. The area is subject to mine subsidence and environmental issues with the lake being 100m away. During site stripping, several odd tree stumps were found and had to be removed filled and compacted. Sudden rain storms caused localised flooding and closed the site for two weeks and to stop environmental pollution from runoff, we provided an ample amount of sediment control fencing. Due to an extensive overrun of time on the construction of the residence, adept and friendly consultation was required with the housebuilder and associated trades to make sure both jobs ran smoothly without any undue delays to either party. Sportszone Group would like to thank SAPIA and congratulate the other 35 entrants in the awards. 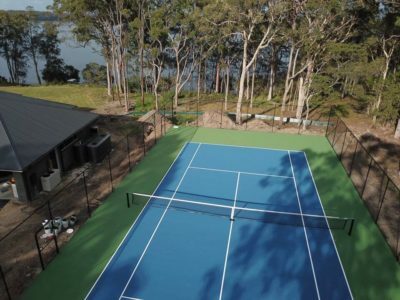 ← How Much Does It Cost to Build a Tennis Court?